PLEASE CLICK ON THE DETAIL ABOVE TO REVEAL THE WHOLE PICTURE. 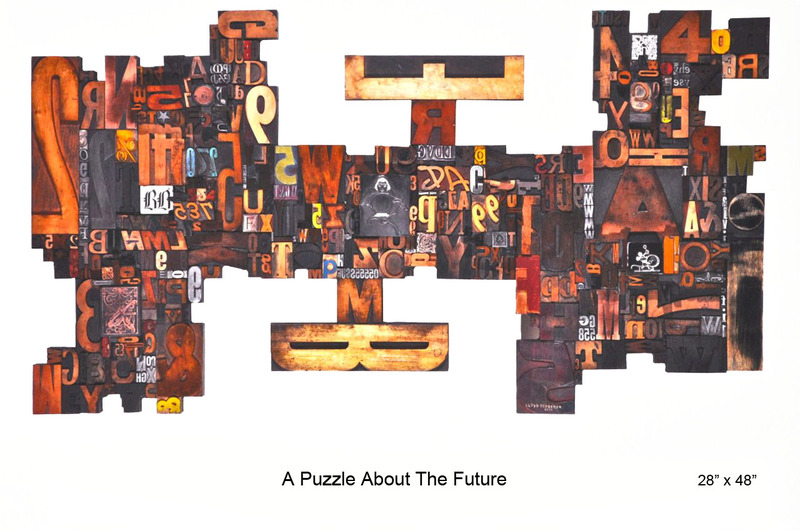 TITLE: A Puzzle About The Future. Lloyd Schermer’s Sculptures and prints. As a newspaper publisher Lloyd was surrounded by the very material that would ultimately become his extraordinary sculptures and monotypes. 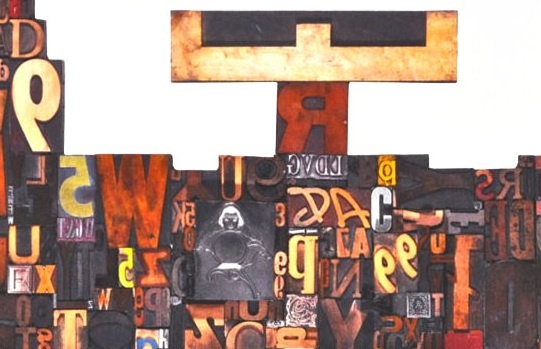 Like all newspapers in the 1960’s, Schermer’s paper was printed using hot metal typeset technology; methods that evolved from the manual technique of placing wooden or metal letters by hand, into page forms, aligned, inked, then printed. Technology changed and soon the news was printed using Offset Lithography. Simultaneously, millions of blocks of wood type, many hand carved, others a century old, became obsolete. Seen as useless, virtually all of this material was discarded and destroyed. Type is part of history and the story of communication. 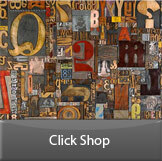 Before Gutenberg, type was made by carving wood, which was slow and expensive. Then in 1477 he discovered how to make molds of letters into which molten metal was poured. He revolutionized communications. Printing books, leaflets, and posters were now made quickly and inexpensively. In Schermer’s work, the impact of this change is captured in man’s most lasting medium – art. 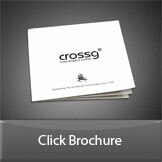 Cross Graphics is proud to offer items of Lloyd’s work FOR SALE through the Cross website. So why not adorn your boardroom, office or company foyer with a piece of printing history turned into an outstanding item of art. (Click on detail to open full image).